Installing in-floor electric radiant heat is a hot trend under new floors in residential, commercial, and hospitality projects, providing evenly consistent supplemental warmth for individual rooms in homes, offices, and cubicles. A programmable thermostat in each room can preset times and temperature of operation. Designed for commercial installations, MP Global Products’ Perfectly Warm QuietWarmth Radiant Heat Film is engineered for floating floors, including laminate, engineered wood, hardwood, and luxury vinyl. The film installs easily over a subfloor or acoustic underlayment. The lightweight roll-out line voltage system employs low-wattage resistance heating of flexible radiant heat film, using just 12 watts PSF and conforming to the warranty requirements of many floating floors. Featuring an ultra-thin filament in a configuration just 4 mm (0.16 in.) 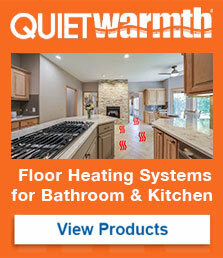 thick, Perfectly Warm QuietWarmth installs quickly without mortar or glue. Available in several convenient rolls up to 14 m2 (150 sf), cutable to suit most floor layouts. MP Global Products also offers Perfectly Warm QuietWarmth Peel & Stick Radiant Heat for Tile Floors. The film is integrated into a waterproof anti-fracture membrane, which helps isolate up to 9.5-mm (3/8-in.) wide cracks in a concrete subfloor from telegraphing through to the tile surface. Similar systems are available for residential installations.